For its shopping centre at Burwood Brickworks, Frasers Property Australia is aiming to create the world’s most sustainable retail development. In terms of design, it’s already a world leader. Frasers Property has just received a 6 Star Green Star Design and As-Built v1.1 (Design Review) rating for the project from the Green Building Council of Australia, representing World Leadership. “This rating is an important benchmark in our progress towards achieving our aspirations for the Burwood Brickworks community,” says Peri Macdonald, Executive General Manager – Retail, Frasers Property Australia. The rating follows the announcement that a new six-screen Reading Cinemas complex will headline the super-neighbourhood centre’s dining, leisure and entertainment offer. 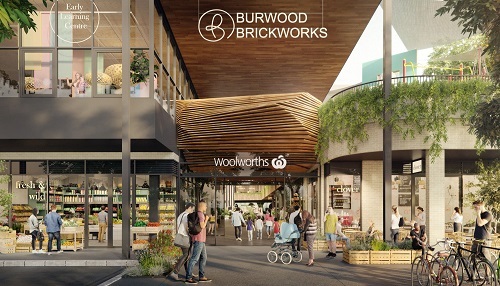 Burwood Brickworks will also house a full-line 4,200sqm Woolworths supermarket and Dan Murphy’s store. Frasers Property is aiming for the shopping centre at Burwood Brickworks to be the first retail development in the world to achieve Living Building Challenge™ certification. This means it will generate more energy than it consumes on an annual basis, retain and recycle all of the water it uses, dedicate 20% of its site footprint for food growing, among many other sustainable initiatives. A mix of on-site rooftop solar PV and off-site renewable energy, utilising the latest in battery storage, will generate 105% of the energy required for the building. North Melbourne-based Russell & George has been appointed to ensure the base building interior design meets the elevated biophilic design requirements that Living Building Challenge™ compliance demands. Designed by Melbourne-based NH Architecture, the 12,900sqm Burwood Brickworks shopping centre will be the heart of the mixed-use community and will benefit from a catchment of some 100,000 people. With a food and beverage focus and a choice of entertainment on offer, also proposed as part of the centre’s tenant mix is a child care centre and medical centre, as well as health and fitness opportunities. In addition to the 6 Star Green Star Design Review rating, the overall Burwood Brickworks mixed-use community is certified with a 6 Star Green Star Communities rating. Retailers interested in a tenancy at Burwood Brickworks should call Frasers Property on 13 38 38 or visit www.frasersproperty.com.au/Retail/VIC/Burwood-Brickworks/Register.